“When the president does it, that means that it is not illegal.” These are famous and not unexpected words from Richard Nixon in his 1977 interview series with David Frost. It might be the finest explanation that Nixon could have had to substantiate another of his famous quotes, “I am not a crook.” No one is a crook if they are in a position to determine what is illegal. “U.S. operations do not involve sustained fighting or active exchanges of fire with hostile forces, nor do they involve U.S. ground troops.” Still, the White House acknowledged, the operation has cost the Pentagon $716 million in its first two months and will have cost $1.1 billion by September at the current scale of operations. the President to notify Congress within 48 hours of committing armed forces to military action and forbids armed forces from remaining for more than 60 days, with a further 30 day withdrawal period, without an authorization of the use of military force or a declaration of war. The resolution was passed by two-thirds of Congress, overriding a presidential veto. President Obama’s statement is called parsing words. Perhaps he could win a legal argument on the technicality of American troops not having boots on the ground, but his refusal to ask Congress to authorize the military action is clearly a violation of the spirit of the War Powers Act (whose primary author was Senator Thomas Eagleton of Missouri). It’s also possible that he could not win on a legal technicality because (a) do we really believe that there are no American troops on the ground in Libya, and (b) if we really want to parse the words, perhaps American pilots flying in Libyan air space are tantamount to armed forces being in the territory of Libya. On the day of Mr. Fahrenthold’s op-ed, the House of Representatives voted 123 to 295 to limit the military operation in Libya. Granted, many Republicans wanted to embarrass the President with what was tantamount to a vote of no confidence. But 70 Democrats joined with the Republicans to express a dissonance with President Obama’s strategy in Libya. When it comes to war, President Obama is in a difficult position. Like every president, he doesn’t want to be the first to “lose a war.” Never mind that it can easily be argued that Johnson and Nixon lost a war (Vietnam), that Reagan lost a war (Lebanon), and that Bush 43 lost two wars (Iraq and Afghanistan). What’s important is that none of them acknowledged losing; no matter what happened they put the conclusion in the win column. Those would be strong words for a president and, unfortunately, a likely prescription to go in the history books as a one-term president. What President Obama needs is a little bit of help from his friends in the Congress. Lyndon Johnson could have used the same, and George W. Bush certainly should have been thwarted by Congress. Most Republicans are going to oppose the president because their political strategy from Day One has been to embarrass him. However, Democrats could also be politically expedient by opposing the president. They could give him the cover, the excuse, to put an end to the continuation of a military policy that is suspiciously similar to Bush adventurism. Democrats supported Lyndon Johnson by approving the Gulf of Tonkin (Vietnam) Resolution in 1964. The initial vote might be excused, since they were given faulty information. However, subsequent Congresses had eleven years to repeal the Resolution, and none did. Shame on the Democrats in Congress whose inaction prolonged the war. In 2002, Congress was also given misinformation about a war, this time by George W. Bush, about so-called weapons of mass destruction in Iraq. However, Democrats should not have been fooled, because (a) Bush had not earned the right to be trusted as honest, and (b) even if there were weapons of mass destruction in Iraq, there were numerous other options to deal with the situation other than invading Iraq. 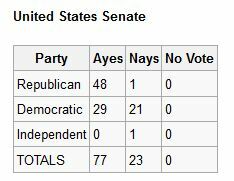 Yet on October 15, 2002, when a vote was taken to authorize President Bush to use military force against Iraq, only 21 of 50 Democrats voted against the resolution. Among those who voted to authorize the war were Senator Hillary Clinton and Senator John Edwards. At the time, Barack Obama was in the Senate–the Illinois state senate– so he didn’t vote on it. It can be argued that the failure of Democrats to stop President Bush in his tracks in 2002 set the stage of open-ended American presence in Iraq and Afghanistan. How many men and women have died for these questionable efforts, and how much money has been spent that has contributed to the United States’ debt, as well as depriing vital domestic programs of necessary funding. This is why, when in a separate vote on June 24, in which Democrats joined with Republicans to reject a measure to cut off funding for offensive operations in Libya, it was just more of the same. Members of Congress have less of an excuse than a president to back off from a war. Congress will never be accused of being “the first to lose a war.” Since President Obama feels that military hawks are his primary constituency when it comes to foreign intervention, Congress needs to step in and help him out. Let the Democrats in Congress take one for the team. Let them also articulately explain to the American people why military adventurism is neither wise nor effective. Let them describe to the American people why getting out of wars will help put people back to work. They can do it. The Gulf of Tonkin resolution was nearly fifty years ago. Have Democrats in Congress learned anything since then? They had, and still have, a chance to show that they have learned the lessons. In doing so, they will do a tremendous favor for President Obama, for themselves, and most importantly for the country.